EZ-TIP™ enables medical device manufactures to easily tip form or flare catheters, dilators and guide sheaths. We design new products, redesign or troubleshoot existing products. We strongly believe that EZ-TIP™ will make your life easier and less frustrating whether you are at the prototyping phase, scale up phase or manufacturing phase. We have developed a truly reliable, repeatable and easy to set-up and operate catheter tipping system. 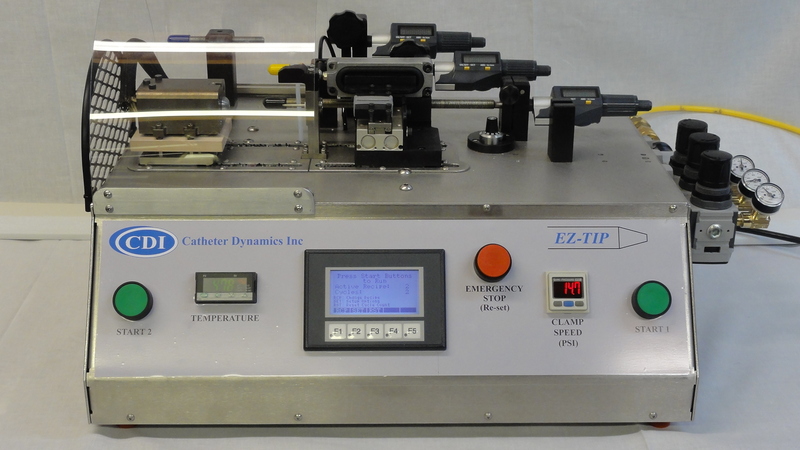 EZ-TIP™ allows you to accurately control the tipping temperatures throughout the day and hold it consistently with a temperature range of +/- 2° F. This precise control eliminates any potential for overheating the mold that may result in burning the material inside the mold resulting in machine downtime. To consult with companies developing catheter based products so they can take advantage of our 70+ years of experience to cost effectively design and quickly bring new products to market. To make life easier for designers/developers and manufacturers by providing a new catheter tipping system that is intuitive and offers fewer parameters to develop a process. Our goal is to provide a fast...repeatable...high yield process so the assemblers do not have to struggle to make it work.